Anyone who has ever worn uncomfortable shoes will no doubt confess that attempting to find any joy in a walk with barking feet is nearly impossible. In these situations, I highly recommend being carried on the shoulders of adoring fans (i.e. Cleopatra-style). If this is unavailable, the next best option is to get a good pair of shoes with a padded wicking sock. Lightweight backpackers identified the value in hiking with running shoes long ago as the need for heavy lugged boots is best left to construction sites. After all, walking along a dirt path is no different whether in your yard at home or in a National Park. Once past the stigma of needing boots, users will quickly realize their feet are far more comfortable and they will be able to walk longer distances and step more safety on difficult terrain. Running shoes also allow the user to fatigue less because of foot flexibility, breathability, and weight. “Camp shoes”, such as those clown shoes known as “Crocs”, can also be left home as they are unnecessary which cuts down on the weight of yet another unneeded piece of gear. Much like with any piece of gear, opinion differs between running shoe choices. After absolutely hating a pair of Merrell’s and not having much luck with finding a size 14 elsewhere, I have found extreme comfort in a pair of Inov-8 Rocklite 318 GTX (http://www.inov-8.com/Products-Detail.asp?PG=PG1&L=27&P=5050973156). By far, these are the lightest shoes I own and they are terribly comfortable. They have a very good tacky sole and tie snugly enough to avoid blisters. I broke them in on a 20 mile hike and I only realized my feet didn't hurt when I was trying to fall asleep and discovered my feet had never felt better. I have been very impressed with these shoes and only time will tell if they stand up to the abuse of backpacking. Other popular lightweight footwear includes Salomon XA Pro's, Montrail Hardrock, and Montrail Vitesses. GoLite also makes amazing stuff and started making shoes within the last two years. Unfortunately, it is uncertain whether their footline will continue as their manufacturer (Timberland) decided to discontinue making shoes for GoLite. 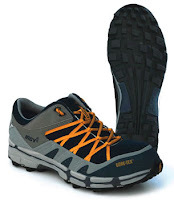 Some choose to avoid waterproof membranes such as Gore-Tex, which exist in the Inov-8 Rocklite 318 GTX, because it causes the shoe to be a little heavier, breathe less, and it doesn’t dry out inside as quickly. 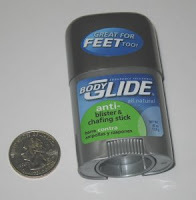 These things may contribute to blisters. These are valid points. To me, however, I have stumbled and bumbled my way into too many puddles during all seasons to know my best option was a waterproof shoe. To me, the chance of having wet feet while trying to hike was a much worse option. A good Merino Wool or SmartWool wicking sock and some deodorant on the bottom of your feet will also make all the difference in the world to a cushy, supportive and blister-free hike. My personal favorite is the “Darn Tough” (http://www.darntough.com/onmountain-1409.html) brand of socks and “Body Glide” (http://www.backpackinglight.com/cgi-bin/backpackinglight/body_glide_45_anti_blister_stick.html) brand of anti-chaffing deodorant for feet. 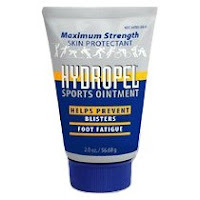 Hydropel Sports Ointment (http://www.backpackinglight.com/cgi-bin/backpackinglight/hydropel.html) is also a great option for stopping wet feet before they start sweating which cause blistering and hot spots. Another solid option is to add a thin sock with a heavier sock over it. With this configuation, any chaffing will occur between the two layers of socks and will otherwise be minimized on your foot. For winter hiking, many incorrectly believe they need boots. The reality is, running shoes are again a solid option. In this case, a Gore-Tex membrane is preferred along with a heavier wool or Merino/SmartWool sock. Add a pair of appropriately sized waterproof gaiters and you've got an excellent winter foot system. If conditions are just too soggy or snow is too deep for your feet to be comfortable in this system, then snowshoes would probably be more appropriate. Many folks may feet that this kind of option doesn't make a heck of a lot of sense when dealing with a lot of creek crossings. I'd actually argue that it makes perfect sense. When I approach creeks, I roll up my pants, take off my socks, take out my insole, take off my gaiters, unbuckle the hip belt of my pack...and cross the creek. When my shoes get wet, usually they are almost 100% dry by the time I put my gear back on, or are only minimally wet, since they are mostly waterproof anyway. With the right footwear system, no doubt a lightweight backpacker can enjoy more of the scenery and adventure instead of worrying about a tire change. It seems like the topic of hats is a bit of an idiotic discussion for a backpacking blog, or at the very least, an underappreciated topic. The reality is, the right hat can make quite a bit of difference and can do everything from block the heat and damaging UV rays from the sun, offer shelter from the rain and snow, sweep sweat from your eyes, keep branches from poking you in the face, repel wind, mosquitoes and other bugs, make a good barrier against spider webs, and can even serve as a container in a pinch for water or berries. To some, any hat may seem “good enough”. This blog isn’t dedicated to “good enough”; it is dedicated to making smart lightweight choices. Fortunately, there are some options worth discussing. Tilley (http://www.tilley.com/thumbnail.asp?catId=13&gender=m&extractBy=CategoryId&id=1) is a Canadian manufacturer who offers a variety of full coverage hats. As far as I know, they are also the only hat manufacturer which boasts an owner’s manual, has insurance, floats, and offers lifetime replacement. I can say with certainty that it is the best hat I’ve ever owned and has made a tremendous difference from that of a standard baseball cap. Worth mentioning is my own acknowledgment that I look like an idiot wearing one. Some people look good in hats, I don’t. In fact, I tend to argue that I look my best from a far distance, in poor lighting, and with heavy fog. Fortunately, backpacking doesn’t require a tremendous sense of style and the functionality of the hat far outweighs any personal desire I have to otherwise look good. Tilley hats come in a variety of sizes and styles with different colors and breathability options. I’ve found that the Mesh option works best for me as it keeps me cooler and still handles most rain events. 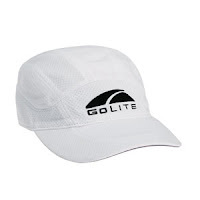 The GoLite Mesh Cap (http://www.golite.com/product/proddetail.aspx?p=AC0214&s=1) is a great breathable option for people who wish to use a lightweight baseball cap style hate. The colors from GoLite have always been poor in my opinion, but again, it is a very functional hat. 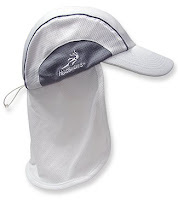 Head Sweats (http://www.headsweats.com/productcart/pc/viewCategories.asp?idCategory=50) is a manufacturer which caters to the running crowd. They offer all kinds of lightweight and breathable hats and visors to include some with drop tails consisting of cloth to protect the neck area. 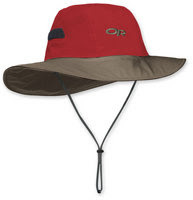 Outdoor Research (http://www.outdoorresearch.com/site/browse/Headwear/Rain.html) offers a product call the “Seattle Sombrero” and others which offer full protection in a Gore-Tex shell. I’ve found this hat to be impervious to rain even in a downpour and is amazing in the snow as it is like having an umbrella overhead. 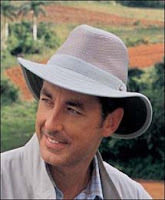 If you really want to use your hat to its greatest capacity, treat it with Permethrin, a synthetic chemical used in insecticides and insect repellant. It won’t hurt you or most mammals or birds and lasts for weeks. And yes, I know the words run into the picture on this particular blog, I don't know why, I just know that the automatic settings on blogger.com makes me mental because there are so many code issues which a general user can't resolve. Oh well. Picking the right flashlight for lightweight hiking is a chore many have grappled with as there are so many options. These options seem to get heavier, costlier, bulkier, and more confusing the more this topic is considered. Fortunately, some flashlights have edged their way to the top and they don't include the old MAG light which is a useful tool for bludgeoning an attacking grizzly but not for much else. When considering a lightweight flashlight, the user needs some general understanding of things that work and things that don’t. For example, a red filter on a flashlight can save your night vision once it is turned on. When a white light is used, it will take anywhere from 15-30 minutes for your night vision to be restored. Therefore, a simple red filter on any light is a good idea for simple nighttime map checking, reading, or camp chores. For hiking, white light seems to be the best choice as it is most visible. Similarly, different lighting levels may also be important as it makes as much sense to try to read with a blazing light as it does to try to hike and navigate with something very dim. Of course, how much light is desired is based on the individual hiker and conditions. No doubt there are people who would like to bring a spotlight while others would be plenty comfortable with no light at all. Over time, I found that I gained little comfort with more light yet still felt uncomfortable with too little light. Mentally, I figured more light would make a huge difference, but the reality is that all light disappears into the mass darkness of the wilderness, can't get past trees, or otherwise doesn't reach whatever the destination I'm seeking to highlight. For me, minimal light is necessary, but no light at all doesn't make a lot of sense. Having the ability to obtain light is as much about useful utility as it is about making yourself more visible to search and rescue teams if necessary. Batteries are also important and users are encouraged to use the same batteries for any items they carry so they can be interchanged in a pinch with one another. It is also important for the user to be able to change batteries on their own, in the field, with little to no tools which in many cases is impossible either by design or by lack of special implements. Also standard Alkaline batteries have less power than Lithium, but Lithium tends to cost more. 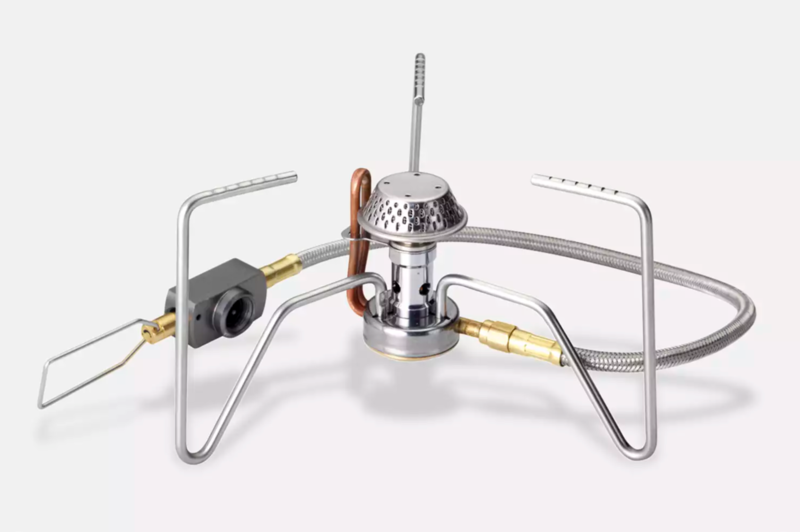 The type of bulb is also an important topic as a standard bulb has multiple fragile implements and is subject to damage quite easily whereas an LED bulb has often been described as indestructible and able to last for decades. The key to any good bulb is the measurement of the “lumen”, or the unit of luminous flux which is essentially a measurement of the perceived power of the light based on the sensitivity of the human eye to different wavelengths of light. A couple other good tips when searching for a flashlight is to determine the climate it will be used and the utility necessary. For example, due to fluctuating temperatures, condensation, rain, snow, and the inevitable drop into a creek bed, having a waterproof, floating, or highly visible flashlight might be a good idea. Similarly speaking, a flashlight mounted in a manner to wear on the head (i.e. a headlamp) might be the most practical hands-free method to use any flashlight for any reason. Thru-hikers would likely argue that some kind of belt-mount mechanism is equally important as having the light beam closer to the ground is often preferred during night hikes. Knowing all these things, there are a couple options available which are solid choices for lightweight backpackers. The manufacturer Photon Light (http://www.photonlight.com/) offer multiple options, but one of the lightest is the Photon Micro-Lite II. Weighing in at just 6.3 grams, it brags to be visible over 1 mile with an on/off button and the whole thing is about the size of a U.S. quarter. The battery lasts 12 hours and the entire unit is only $16 or so. An available hat-clip likely makes this the most lightweight option on the market. The “NEW Photon PRO Flashlight” (not to be confused with older models) boasts 1000+ lumen candle power from 2-watt Cree LED, 4 safety modes, weighs in at 46 grams with a single AA Lithium battery. It lasts for 1.5 hours at full power or 250 hours at reduced brightness and costs roughly $50. The manufacturer Fenix (http://www.fenixlight.com/newping.asp) also offers a lightweight favorite in the LD01 Fenix which weighs 14.8 grams with just 1 AAA battery. It is waterproof and has three light settings: 10 lumens (8.5 hour life), 27 lumens (3.5 hour life) and 80 lumens (1 hour life). It uses a top end Cree Q5 LED and costs around $45. For those interested in strictly a headlamp, the manufacturer PETZL (http://en.petzl.com/petzl/LampesAccueil) has many offerings with one of their three lines of headlamps (TIKKA, TACTIKKA and ZIPKA). Each of these offers numerous different options and frills for varying costs. One item, the Petzl e+LITE has quickly become popular because it weighs only 27 grams which is a quite a bit less than the 65-98 gram weight which is common for other headlamps. It also only costs $24 instead of $60+. It claims to shine up to 19 meters and lasts for 45 hours or so. It even has a red filter and strobe signaling mode. Princeton Tec (http://www.princetontec.com/) also offers some nice options, of specific note, a 78g headlamp known as "Fuel". The manufacturer SureFire (http://www.surefire.com/) makes a variety of lights which are very powerful and durable, but few are lightweight or practical to cover in this venue. Another option which doesn’t require batteries is something like the UCO Mini Tea-light (http://candlelantern.com/mini.html) which is nothing more than a small candle within a fairly windproof glass/metal container which weighs around 3.2 ounces and costs less than $15. Lastly, lightweight backpackers may consider a natural light source (i.e. moon, fire, etc.) which, depending on your needs, may be plenty sufficient. In the end, it depends on the preferences, needs, budget, and competency of the user. Over the weekend I hiked St. Mary's Wilderness which is a trail consisting of 10.1 miles with an additional 5.4 mile option to see some waterfalls in the complete opposite direction of the principal loop. I decided to hike the entire 15.4 because I figured the more I could squeeze into this trip the better it would be. St. Mary's Wilderness is essentially a 10,000-acre plot of protected land on the western slope of the Blue Ridge Parkway just outside of Shenandoah National Park in Virginia. "Wilderness" isn't a nickname, it is actually a designation which means the area is NOT maintained and is intended to shift and grow as nature intended with the only interference by man coming as a result of a fire or insect infestation. In summary, there are trails, but if they disappear into the wild, then so be it. Unfortunately, this hike did not turn out as I had hoped and quite honestly it was a bit of a disappointment. I hiked it on a November day which had temperatures in the 50's during the day which was quite comfortable. Regrettably, I missed the best time to go hiking in the fall as I was strapped down at work for the last couple weeks. Although the brilliant colors were gone, many of the maple trees still maintained amazing colors which were quite a sight from the distance. Higher up on the summits, however, brown was the principal color still on the trees with some color hiding on the duff floor. The weather was about the only thing that seemed to work out as otherwise my trip was easily stumped by trails which were very overgrown, trees crossing the path which required constant efforts to go over, under, or around them, and a very challenging navigational efforts as the unmarked and overgrown trail was only further hidden by the fact that fall had embraced the area with full force and leaves and branches covered everything to the point that it was nearly indistinguishable. My biggest regret is that I added the extra 5.4 mile loop to St. Mary's Falls as I simply never found it. I could hear it in the distance, but the trail was no where to be seen after several miles in. After some efforts to bushwack towards the sound and coming to the reality that it was a roughly 2,000 foot drop off very steep terrain with poor visibility and footing, I decided to cut my losses in favor of not getting injured or lost and instead finishing the rest of the hike. As such, the gloriously described falls consisting of a healthy drop onto massive boulders and mountain laurel will be left for another day. Overnight temperatures dipped below freezing and my ultra-light sleep system stood up to the weather with the only exception of my feet being "less than warm". Nighttime seemed to last forever as the sun dipped behind a mountain around 3:30pm which left my campsite with a twilight scene for about the next 90 minutes until the sun set shortly after 5:00pm and didn't make another appearance until 7:00am the following morning. After drinking some hot tea and chow warmed nicely from my alcohol stove, I decided to light a fire to pass the time, stay warm, and to dry my sweaty Tilly hat and SmartWool shirt. Normally I don't get the chance to have a fire being that they are prohibited in most national parks, but I was fortunate to be in a designated area where they were allowed since I wasn’t in any part of the national park system. The coals remained glowing most of the night as it was quite windy and offered some entertainment as I tried to sleep. The following morning I had a 6 mile hike out which I can honestly say was one of the easiest hikes of my life as it was on a nearby park service road which was well graded and wide, despite being full of rocks of all sizes and shapes. I was back to my car within about 2 hours which surprised me how quickly I could move given the right conditions and motivation...and was a testament to lightweight gear. The picture of the bear above was one I came across about 100 feet from the entrance to St. Mary's Wilderness. It was about 20 feet from me and my unprepared fumbling and bumbling for my camera while facing the blazing sun did nothing but ensure my picture was fairly poor. It was a nice sight, however, and was much more welcomed then the unseen bear who growled at me while I was about 5 miles into this hike. The bear was hidden behind a row of rhododendrons which were as intimidating as walking down an ally between two tightly wedged buildings in the city. If the bear decided to do anything then strike up a conversation, I would have had little options other than to hope I digested poorly. Fortunately, black bears are relatively decent to deal with, unless you have officially overstepped your boundaries or got between it and a cub. As soon as I started talking to it calmly, it quieted down and I pushed forward. Despite this not being my favorite hike, getting out was better than any day hiding behind a keyboard. I just prefer having as many things to see as possible (valleys, vistas, summits, waterfalls, wildlife, flowers, etc.) as otherwise I’m not sure I’d know the difference between a bad hike and a night in my own backyard. Shelters, sleeping bags, and backpacks, aside from representing the “big 3” in backpacking, also represent the products with the most new innovation and changes in recent years. Until the lightweight backpacking movement took hold, I carried an 8-pound Gregory backpack. The suspension was great, it was extremely durable, and it held pretty much everything except my car. And, it was unbearably heavy. It was so heavy, in fact, that I was miserable. My legs, knees, and back always hurt and I almost always didn’t get very far or move very quickly. I think I would have won a gold medal in sweating too if it were an Olympic event. Aside from the fact that it was killing my body and ruining my experience, the reality was that it was also very unsafe. Sporting a load of 40-60 pounds ensured that any misstep would leave me face down or hurt. Fortunately, lightweight manufacturers have saved you and I from this problem by revamping gear which ultimately serves the same function, it just happens to be lighter. Although Gregory, Osprey, The North Face, Mountain Hardwear, etc. all continue to offer very bombproof and comfortable packs, the reality is they are overly heavy, overly big, and end up hurting your backpacking experience more than helping it. 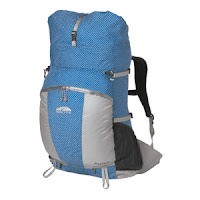 Now, instead of carrying an 8-pound pack, I have found plenty of comfort and support in packs which weigh anywhere from about 13oz made of SilNylon to 2 pounds made of extremely durable ripstop fabric. To me, lighter packs make all the difference in the world and small things like having hip belt pockets to access my compass, snacks, maps, etc. are really convenient. Lighter packs are also often water resistant because of their fabric and waterproofness can be virtually guaranteed with something as simple as an internal trash compactor bag instead of a pack cover or multiple interior compression sacks. With these options, crossing a stream won’t be so treacherous and no doubt going further, faster will be a real possibility. 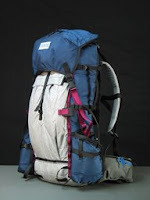 Many lightweight backpackers even often shed additional ounces by removing unwanted straps or buckles, or even the hip belt. Some packs which have really peaked my experience include those made by Ultralight Equipment (http://www.ula-equipment.com/), Golite (http://www.golite.com/), and Six Moon Designs (http://www.sixmoondesigns.com/). McHale Packs (http://www.mchalepacks.com/) are known to be equally competent and offer custom options. Granite Gear (http://www.granitegear.com/) is a favorite amongst lightweight backpackers and offer a unique middle zipper to ease access to gear. All of these options are under 2 pounds. For those looking to go lighter, and even break the one pound barrier, some manufactures offer a variety of SilNylon and even Cuben Fiber packs which are the lightest in the industry. 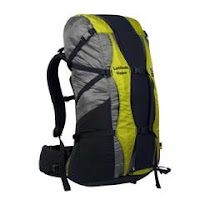 These manufacturers include Gossamer Gear (http://www.gossamergear.com/), Mountain Laurel Designs (http://www.mountainlaureldesigns.com/), Z Packs (http://www.zpacks.com/), and Cilo Gear (http://www.cilogear/ ) to name a few. An unconventional but lightweight choice is offered by Luxury Lite (http://www.luxurylite.com). Choosing a backpack is like choosing any other piece of gear which should be driven by experience, environment, competency, and budget. The mainstream manufactures are slowly catching up, but they aren’t there yet so I can’t recommend even the lightest offered by these guys. One of my favorite backpacking topics is “sleeping systems”. To the inexperienced or uneducated, “system” may seem like a bit of a stretch to describe what most people assume to mean merely a sleeping bag. The reality is, there are better (warmer and lighter) options than just a sleeping bag and this is one of those issues you have to try to believe as many people simply cannot fathom “less” being “more”. Cold weather also seems to be a very quick way to evaluate whether going lightweight was a smart idea because getting cold not only can be devoid of fun, but it can also be life threatening. Lightweight backpacking requires an educated consumer who is willing to make smart choices based on their experience and environment. A sleeping bag is a plenty decent option when sleeping in the wilderness. Unfortunately, it isn’t a terribly efficient system. First off, the mere pressure of your body on the bottom portion of your sleeping bag does nothing but compress whatever insulation you are using to keep you warm. Being that warmth comes from loft, whether it is down, synthetic, pine needles, or whatever, no loft equals no warmth no matter what it is. With that said, and you guessed it, the bottom part of your bag serves pretty much no function other than dead weight – so why carry it. Sleeping bags are also constrictive and no doubt users have been known to fight all night with a zipper to be comfortable. Lastly, sleeping bags often trap dampness, both inside the bag from the user and outside the bag from the environment. If the bag gets wet, the loft may be degraded. If the loft is degraded, so will its ability to keep you warm. Simply put, a sleeping bag is an option, just not necessarily the best one. A quilt is an excellent replacement for a bag and ensures you have only what you need to stay warm. Without the unnecessary weight of the bottom portion of your sleeping bag, by default you just lightened your load. By definition, and much like your bed at home, a quilt is designed to lie on top of you instead of going completely around you. When fit properly, it drapes around your sides which traps warm air just like the bundling effect of a sleeping bag. 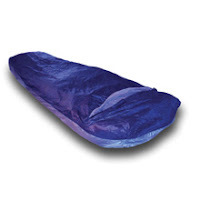 Most backpacking quilts also offer a footbox to keep your feet in place and help keep you warm. Insulation choices range from down to synthetic with synthetic winning out in wetter climates and down tending to be warmer and lighter overall. Several manufacturers make very good quilts which are also very lightweight. These include Nunatak (http://www.nunatakusa.com/), Jacks R Better (http://www.jacksrbetter.com/), Backpacking Light (http://www.backpackinglight.com/), Feathered Friends (http://www.featheredfriends.com/) and others. If you really like the bundling effect of a sleeping bag, try the Sleeplight offered by Gossamer Gear (http://www.gossamergear.com/cgi-bin/gossamergear/sleeplight.html) which is essentially a sleeping bag without insulation on the bottom. Being a person much taller and wider than others, I decided to go with the Caribou sleeping bag from Western Mountaineering (http://www.westernmountaineering.com/) which is just slightly bigger than the other quilt options listed above, but in some cases, it is lighter. The zipper was removed, saving some ounces, and two elastic straps were sewn on to cinch it to my sleeping pad. It functions extremely well in cold weather as I intended - as a quilt. I should mention some people use a 3/4 length bag or quilt especially if they have warm upper layers as it further reduces unnecessary pack weight. The next part of the sleeping system is a good ground pad to take out floor bumps and to provide insulation from the cold ground. Many people seem to think they need expensive inflatable pads and mattresses to be the most comfortable. The reality is, an inexpensive foam pad has a higher “R – value” (measure of thermal resistance), than most fancy and expensive options. Personally, I find foam pads to be a little more comfortable too as they don’t sit up so high and I don’t feel like I’m trying to sleep on a rubber raft. Because they are lightweight and fairly easy to carry, many people use them as a backpack frame of sorts by placing them inside their otherwise frameless or internal frame backpacks. Some manufacturers are putting things such as down feathers or special gels which have low freezing points in their pads. There is some debate as to whether these methods work, but not of any debate is the fact that these options are always more costly and heavier than a simple foam pad. When picking a pad, pick one which is about the size of your torso. This may seem counterintuitive, but the reality is your legs don’t contact the ground in the same manner as the rest of your body and they also don't get cold as easily. Without a full length pad, you can save valuable weight. I’ve also found using my pack under my legs accomplishes the same task and uses something that would have otherwise just been lying around. Part of being successful at lightweight backpacking is using all your resources to their fullest extent. Gossamer Gear is one manufacturers who maintains several options for foam pads http://www.gossamergear.com/cgi-bin/gossamergear/pad_matrix.html. The last part of the sleep system is a bivy made of a waterproof bottom (such as SilNylon) and breathable and water resistant top (such as Pertex). The bivy will help bundle you like a sleeping bag, but it will also allow you greater movement as it is cut larger than a standard sleeping bag which works perfectly for active quilt sleepers. It will also ensure your quilt doesn’t get wet which allows your loft to stay intact and that your body condensation can escape through the breathable fabric. 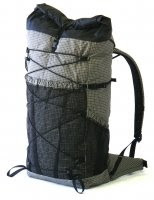 Backpacking Light (http://www.backpackinglight.com/) offers some of the lightest bivys. Some manufacturers, such as Integral Designs (http://www.integraldesigns.com/) offers bivys made of eVENT fabric which allow the user to forgo the need for a conventional shelter and instead stay warm and dry sleeping under the stars. I’ve used my system in below freezing temperatures and the entire system weighs far less than most sleeping bags and offers me much more comfort and flexiblity. I was personally shocked to find out that with merely a base layer of merino wool that I needed no other warming layers despite the cold temperatures. It is also worth noting that the choice of your sleeping system and its warmth rating should not go overboard because users should consider any clothing items carried as part of the system. For example, a sleeping system doesn't necessarily need to be improved if the user is cold at 30 degrees but can be plenty warm by adding a jacket buried in their back. Lightweight backpackers need to utilize all their resources as otherwise carrying something rarely used serves little greater purpose than dead weight. Much like an empty backpack can be used as a sleeping pad for your legs, a jacket can be used while sleeping and socks make excellent gloves in a pinch.